The death of a nine-year-old girl from an asthma attack may be the first fatality in the UK to be directly connected to air pollution, after a professor found a ‘striking’ link between her condition and spikes in toxic air. Ella Roberta Kissi-Debrah died in 2013 after making 27 visits to hospitals in three years due to asthma attacks. She lived 25 metres from London’s South Circular road. 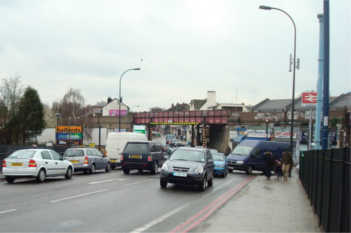 Busy roads of this type regularly exceed legal limits of pollution, and are believed to have been a ‘key driver’ of Ella’s illness, according to Professor Stephen Holgate, an expert on asthma and air pollution at the University of Southampton. He studied records gathered by an air pollution monitoring station in Catford, a mile from where Ella lived. In a report obtained by the BBC, Prof Holgate stated that: ‘Unlawful levels of air pollution contributed to the cause and seriousness of Ella’s asthma in a way that greatly compromised her quality of life'. He went on to allege this could be linked to her fatal asthma attack. Professor Holgate concluded that Ella very likely ‘would not have died’ if ‘unlawful levels of air pollution’ were absent. His statement is based on the ‘striking association’ he discovered between Ella’s emergency hospital admissions and recorded spikes in nitrogen dioxide and PM10 (particulate matter) pollution. She died after one of the ‘worst air pollution episodes in her locality’. The report is being submitted as part of an appeal to the attorney general to reopen an inquest into Ella’s death. The original hearing found she had died from acute respiratory failure but did not establish the cause of her asthma. If Professor Holgate’s findings that Ella died as a direct result of air pollution are confirmed, this could strengthen the case for tougher penalties against high polluting diesel vehicles. Her mother, Rosamund Adoo-Kissi-Debrah, has since been campaigning for a new inquest, as she had never been warned by medical professionals that air pollution may be triggering Ella’s asthma attacks. She told the BBC that she had to resuscitate Ella between 20 and 30 times while waiting for an ambulance. Ella travelled to school along the South Circular in Lewisham, either walking for 30-40 minutes or being driven and sitting in traffic jams. Her mother claimed that had she been properly advised, she would have considered moving and changing Ella’s school. In February the Government lost a third case over its approach to illegal levels of air pollution.